Sunday, 11th May 2018: Center Parcs today announces the awarding of the first tranche of large scale supplier contracts worth over €1 million to Irish companies as the development of its’ first Center Parcs forest resort in Longford continues at pace.Java Republic has been awarded a significant six figure contract for the provision of premium coffee and tea across the resort’s cafes and bars. Meath headquartered family business Briody Bedding has also secured a six-figure contract to supply bespoke beds and top-quality mattresses for the 466 lodges and 30 apartments at the forest resort which will see 2,500 guests enjoy a tranquil slumber in the Irish forest when the resort opens next year.In addition, local Ballymahon based O’Haire Bus Hire has secured the contract to transport the Center Parcs housekeeping staff to and from the surrounding area to the forest resort when operational. Based in Oldcastle, Co Meath Briody Bedding Ltd, established in 1974, is a family run business employing 100 people.Commenting on the announcement, David Briody, Director said the awarding of the contract has put a spring in their step. Center Parcs also highlighted that competitive tender processes are underway for the provision of a host of other goods and services and encouraged interested businesses to log on to the website www.centerparcs.ie/suppliers to find out more information. When complete next year, the €233m Center Parcs resort will offer 466 lodges and 30 apartments to accommodate 2,500 guests.During a Center Parcs short break, guests can enjoy more than 100 indoor and outdoor family activities, including the legendary Subtropical Swimming Paradise, and a range of restaurants and shops.The development will create approximately 750 jobs during the construction phase and when operational, the village will employ up to 1,000 people in permanent jobs and provide a €32m boost to the economy. Founded by David McKernan in 1999, Java Republic set about putting an end to unethically sourced beans, low-quality roasting and inferior blends. In the last 20 years, Java Republic has gone from strength to strength, with over 1,200 venues across Ireland serving over 100,000 cups of Java Republic product daily. Today it is an independent, Irish-owned company offering Ireland’s most exceptional coffee and an incredible selection of 46 organic teas. As it approaches 20 years in business, Java Republic has recently undertaken a €500,000 brand refresh that saw the business rededicated itself to its foodservice clients – providing expertise, insights and passion to help the businesses that serve its coffee and teas. Briody is one of the largest and most comprehensive bedding and furniture manufacturers in Ireland and produces a diversified line of mattress and foundation products. Briody is one of the largest employers in the wider Meath area with a workforce of over 100 people dedicated to providing customers with the highest quality service and bedding products and were recently announced as the overall winner of the 2018 Small Firms Association Awards. They are also among an elite group of companies who were accredited All-Star at the All-Ireland Business Summit 2018 and are leading the way in their sector. Following an announcement in 2016 of its intention to develop a forest resort in Ireland, Center Parcs successfully secured planning approval to invest €233m in the development of a forest resort on a 400-acre site in Newcastle Wood, five kilometres from Ballymahon in County Longford. 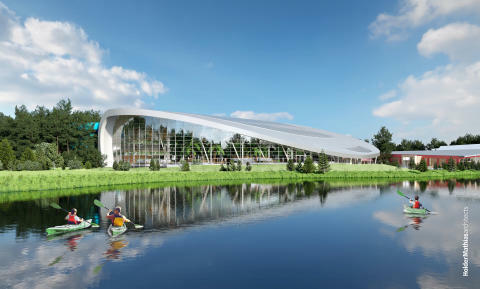 Center Parcs estimates that, when operational in 2019, the new forest resort will add approximately €32million to Irish GDP per annum and €1bn over the next 20 years. Center Parcs awarded its first major contract in Ireland to Limerick based Roadbridge Civil Engineering & Building Contractors in March 2018 to undertake key infrastructural development works. The infrastructure contract comprised the earthworks, road and path networks, utilities, drainage system, the lake and building platforms. In December 2017, Dublin based construction firm John Sisk & Son was awarded the contracts for the construction of the 466 lodges and 30 apartments as well as the state-of-the-art centre buildings – housing the iconic Center Parcs Subtropical Swimming Paradise, restaurants, bars and shops and moved on site in January 2018. The vast majority of the woodland on all Center Parcs sites remain untouched, with only 10% of the total area being built on. Retaining and encouraging a vibrant and thriving forest environment is central to Center Parcs’ environmental ethos and is a core part of the offering at every Center Parcs Village.